Do you want to impress the soon-to-be new mom with a really special sweet gift? 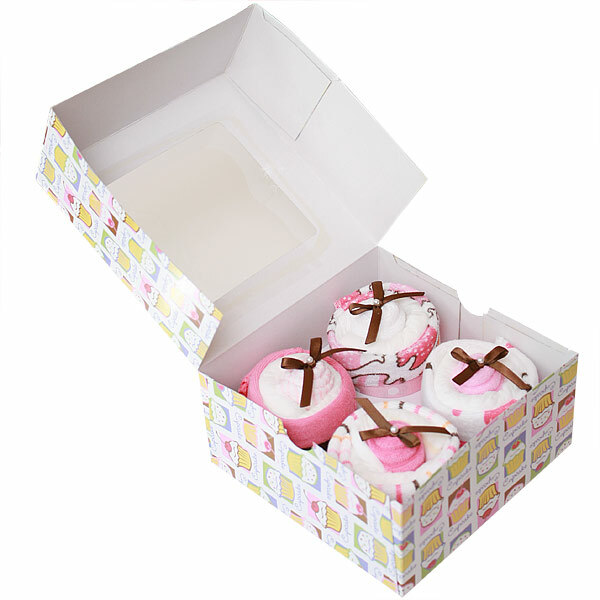 Box of washcloth cupcakes is a cute gift for a baby shower. Sweets with 0 calories! The mother-to-be will soon be using those washcloths and diapers. Each washcloth cupcake comes with one Pampers Swaddlers Diaper size 1 (7-14 lbs.) and two washcloths (patterns vary). You will get 4 cupcakes in a gift box. All diapers and baby items are usable. Washcloth cupcakes can be made with custom color ribbons and washcloths. Just send us a message and we will be happy to give you a quote for a custom order. All our gifts made of highest quality ingredients with greatest care and love. Everything included is ready to use and easy to disassemble.